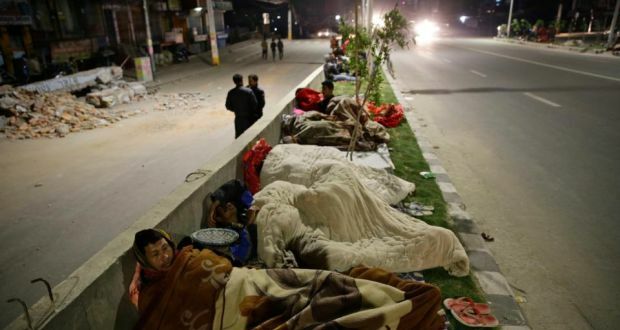 The question that has been on everyone’s mind since the Great Earthquake seems to be: what are the possibilities of another big quake striking Nepal in the coming weeks and months? The possibilities of another big quake are very low. Last Saturday’s quake with its epicenter in Gorkha released much of the elastic strain energy that was accumulated in that fault. The energy hasn’t been released completely but it is being released in small amounts in the aftershocks that we are continuing to feel. Another big event in that same fault and around that same area has become very unlikely and such fears are unfounded. A table supposedly from the United States Geological Survey (USGS) has recently been circulating, which lists the probabilities and the magnitude of quakes that could now occur in the region. This table states that there is a 1 percent chance of an earthquake greater than magnitude 7 hitting us between May 1 and May 31. What does that mean? Aftershocks are often forecasted based on empirical relations. But this does not mean that those forecasts will definitely come to pass. So a 1 percent chance for a big quake means that there is a 99 percent chance that such a big quake will not happen. That is what we must focus on. USGS has even stated at the bottom of that table that these predictions might not occur. We have been experiencing aftershocks in decreasing frequency and decreasing intensity. This means that there is no such risk of a big quake hitting us soon. If we look at global data on big quakes, such aftershocks will continue for at least a week or two. Two large quakes occurring in a short time span, one after another are very rare. One case, Italy conducting research on earthquakes. On May 24, 2010 a 5.6 magnitude quake occurred. A few houses fell and a few people died. Aftershocks too kept occurring. After five days, another 5.8 magnitude quake occurred in the same area, destroying houses that had cracked in the earlier quake. Sixty people died in that second quake. But again, this was a very rare occurrence. In the Himalayan region, there is no record of two large quakes striking one after another.